Abstract: This article discusses the evolution and work of Brown University’s Climate and Development Lab (CDL). As leaders of the CDL, we engaged students in experiential education while attending the United Nations climate change negotiations in Cancun, Mexico in 2010, and in Durban, South Africa in 2011. Simultaneously, we collaborated with students to provide relevant and timely research and public scholarship oriented by the goal of advancing global justice in international climate change policy. Here we offer a conceptualization of our pedagogy for the CDL, which is a synthesis of two guiding principles: ‘engaged education’ and ‘global just sustainability’. We discuss the ways in which we organized the CDL in relation to this pedagogy and everyday logistics, and reflect upon our accomplishments and the challenges that we faced. We argue that while there are areas where we can improve upon our practice, the potential of this type of learning is considerable, and can be complementary to producing scholarly outputs that contribute to a more just and sustainable world. – Karl Marx, Theses on Feuerbach (1845–1846). So began a letter published in the United Kingdom’s Guardian newspaper, immediately after President Obama was reelected to office, and just a week after superstorm Sandy had wreaked havoc in the northeastern United States. The letter was accompanied by a powerful animated video called “The Climate Paradox”, calling attention to the injustice that the poorest countries in the world—which have the lightest footprint on the climate—are suffering worst and first from climate change’s impacts. Both were prepared by Brown University’s Climate and Development Lab (CDL or “The Lab”), in collaboration with Pa Ousman, the Chair of the LDCs group, and the Watson Institute at Brown University. We learned that the letter had circulated in the Administration, including in the State Department and the White House. This is just one of many successes of the CDL, our experiment in engaged learning outside the classroom. The CDL strives to provide relevant and timely research oriented by the goal of justice and environmental sustainability in climate change policy. We have a multi-regional focus on the climate policies of the Least Developed Countries, in Latin America and in the U.S. During the three years that the Lab has been active, we have published ten policy reports on issues of equity and climate change, which have been cited widely by delegates in the UN climate change negotiations. We have garnered media attention in over one hundred outlets ranging from the New York Times to the China Daily; developed Latin America’s first multilingual website specializing on climate change (called Intercambio Climático); and published numerous academic articles and drafted two book manuscripts under contract at a top academic press. Importantly, we have engaged students in these activities, with the goal of fostering transformational learning experiences. In this piece we focus especially on a trip in 2011, when the CDL sent a team of ten students, faculty and fellows to participate at the U.N. Climate Change negotiations in Durban, South Africa. Our Lab partnered with the Least Developed Countries negotiating group, presenting our team with a unique opportunity to work at the heart of the negotiations with the poorest and most vulnerable countries in the world. This proximity to the events gave us excellent access to monitor the main stories and issues unfolding in Durban, and to engage with the purpose of positively influencing the negotiations. This article details what we have tried, what seems to have succeeded, what challenges we have faced, and how we plan to improve the Lab moving forward. We begin with a conceptualization of our pedagogy for the CDL. This includes the synthesis of two guiding principles: ‘engaged education’ and ‘global just sustainability’. Next we describe our preparations and engagement in the U.N. climate change negotiations in Cancun, Mexico and Durban, South Africa. We discuss our accomplishments related to these negotiations, and how we brought what we learned back to campus. At Durban, we addressed five sub-issues: the U.S.’s policy approach, climate finance, the LDCs’ group, agriculture, and Latin America. Each brought together overlapping groups of students and leaders in the Lab, drawing upon their interests and expertise. The final sections of the paper provide an initial evaluation of the Lab’s work, and our thoughts of possible ways to make the Lab and its engaged education approach sustainable over the longer term. We identify two main challenges in our efforts to conduct engaged education for global just sustainability. First, we have encountered a tension between conducting justice-oriented public advocacy work, while cultivating an educational space that is amenable to multiple perspectives. Second, we have found it challenging to effectively navigate competing priorities with limited time and resources. We begin by describing our approach. Our pedagogy for the CDL has two main components: engaged education and global just sustainability. Here we discuss and develop each of these components. As Karl Marx, John Dewey, Bell Hooks, Paolo Freire and other great educators have taught us, learning should not be just about interpreting or philosophizing about the world, but rather, working collaboratively to change it. This is the entry point to our approach to engaged education. Particularly relevant to our context, Ernest Boyer argues, scholarship of engagement means connecting the rich resources of the university to our most pressing social, civic and ethical problems…” (1996: 32). Our approach to engaged education builds from the insights of scholars to incorporate three main guiding principles. First, in the tradition of Bell Hooks (1994), education should be rooted in individual experiences, and strive for social justice. She argues, “It begins with people’s lived experience and works to foster a critical perspective and action directed toward social change’’ (14). This perspective acknowledges that society is organized in fundamentally unequal ways, and that students, teachers and community members alike, have understandings of the world that regularly serve to reproduce these structures. Uncovering these belief-systems and challenging them is an essential step in working for social justice. Thus, engaged education is about fostering opportunities that challenge existing idea structures, and integrating new knowledge and experiences. As Dan Butin argues, “Justice-learning is concerned most prominently with making visible the contingency of our present situations; that we are always-in-the-making of our beliefs, practices, and structures” (2007: 181). By escaping…the walls of the classroom, the service-learning experience offers… an ambiguous and open-ended situation. Answers are no longer found at the end of the chapter…, or assumed to be static and universal. Rather, the sheer complexity of social reality—when carefully and systematically examined and reflected upon—yields opportunities for the realization that justice (or the lack thereof) is contingent upon our engagement with the world (181). Third, engaged education is action-oriented, and focused on influencing more just practice in the world through collaboration with marginalized communities in the production and dissemination of new knowledge. This builds from John Dewey’s belief that knowledge and learning are most effective when human beings work collaboratively to solve specific, strategic, real world problems (citing Harkavy 2006: 19). And in line with scholars of community-based participatory research (e.g. Minkler and Wallerstein 2011), we see great value in partnerships with individuals, groups, or leaders that represent those disadvantaged or marginalized. As Boyer (1996) has emphasized, “engagement requires not only communication to public audiences, but also collaboration with communities in the production of knowledge (as articulated in Barker 2004: 126). As we discuss, in our work, this took the form of extensive collaboration with delegates from the 48 Least Developed Countries and the Latin American Platform on Climate in working for a more just outcome to the negotiations. Key to this approach is integration of the concept of environmental justice. The environmental justice movement and concept emerged in response to evidence of uneven distribution of environmental pollution, particularly in communities of color in the U.S., and unequal efforts to clean it up. The movement has taken form elsewhere to consider other groups such as women, indigenous communities, and the poor, and other ways that people are deprived of environmental rights (Cutter 1995, p 113 cited in Agyeman 2003: 8; Martinez-Alier 2002). David Schlosberg (2007) presents a useful threefold conception of environmental justice: “equity in the distribution of environmental risk; recognition of the diversity of the participants and experiences in affected communities; and participation in the political processes which create and manage environmental policy” (517). Others have also included ideas such as a focus not only stopping “bads” but also promoting environmental “goods” (Cutter 1995; Bullard 1999) and international or global dimensions of environmental justice (Roberts and Parks 2006; Martinez-Alier 2002; Faber 2005). The just sustainabilities approach recognizes that there are often tensions between what might be appropriate pathways to living within ecological limits, and what might be equitable and just for communities of different geographies, races, ethnicities and genders. Justice in real life is a concept often rife with ambiguity, with many divergent interpretations of what might be considered a just way forward. As Schlosberg (1999) argues, there is a coexistence of multiple political beliefs as to the causes, situation of, and possible solutions for environmental justice” (111). Thus, working towards just sustainabilities is an inherently political process, in which competing interests, preferences and identities must be worked out. Following various scholars (Agyeman 2005; Roberts 2006), we take an explicitly global view of just sustainabilities – what we call global just sustainability (GJS). As Agyeman (2005) argues, “there is great (and under-researched) potential for the notions of environmental justice, human rights and sustainability to permeate environmental regimes and international policy and agreements” (11). Given that climate change impacts everyone, albeit inequitably, developing responses necessitates a global lens – even when some actions are conducted locally. International climate change policy has implications not only for how the problem of climate change is addressed (or not addressed), but also in how rights to the atmosphere are allocated. There is a growing scholarship, much of which has emerged from scholars and activists in the global South, which is useful here. The concept of unequal ecological exchange calls attention to the disproportionate ecological impacts, including climate change, of unequal trade relations on countries in the global South (Parks and Roberts 2006). The related concept of “ecological debt” refers to the financial sum that the global North owes to the global South for a history of natural resource pillaging and hogging of atmospheric space. In response, frameworks have been developed to determine the allocation of greenhouse gas development rights based on principles of justice (e.g. Baer et al. 2007). Another concept, “adaptation apartheid” refers to the disproportionate capability of wealthy nations to respond effectively to climate disasters, and the uneven flow of finance to projects in these countries compared to poorer ones. Other scholars have developed the concept of adaptation finance justice to develop certain benchmarks for how forms of international inequality related to dealing with climate impacts can be addressed (Ciplet et al. 2013). Overall, in a world with limited natural resources and atmospheric space, how rights are allocated could influence who has the ability to develop their economies and living standards. Importantly, GJS necessitate shifting power balances in global political processes to better account for the interests of marginalized groups, rather than allowing those with privileged access to continue to disproportionately benefit from the earth’s resources. There are many ways that this goal can be advanced – from engaging in grassroots community efforts, to state and national policy-making, to participant observation in transnational social movements and international policy negotiations. And the focus of GJS may be on elevating the capacities of any number of environmentally and politically marginalized groups. We have focused much of the Lab’s efforts on strengthening the capacities of delegates from the Least Developed Countries in the U.N. climate negotiations (the LDCs). Despite contributing less than one percent of cumulative global greenhouse gas emissions, the 48 LDCs are five times more likely to die from climate-related disasters (Roberts and Ciplet 2012). These countries also have historically had the least capacity to negotiate for fair and just policies in the U.N. process. Overall, we agree with Middleton and O’Keefe (2001: 16, cited in Agyeman et al. 2003) that, “unless analyses of development begin not with the symptoms, environmental or economic instability, but with the cause, social injustice, then no development can be sustainable”. The CDL came together as a collaboration of three individuals: Timmons Roberts, recently hired Professor and the then Director of the Brown University Center for Environmental Studies; David Ciplet, PhD Candidate in Sociology at Brown; and Guy Edwards, part-time Brown Research Fellow. Roberts had more than a decade of experience conducting research at U.N. climate negotiations and Ciplet had conducted research fieldwork at the previous negotiations in Copenhagen. Edwards was in Ecuador establishing in collaboration with Roberts a project centered on a multilingual web portal focused on Latin America and climate change,Intercambio Climático, co-founded with the Latin American Platform on Climate (LAPC), and on writing a book on Latin America in the negotiations. 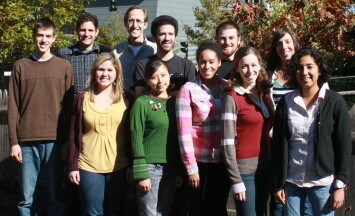 In December 2010, a team of eight Brown students accompanied us to the U.N. Climate Change Conference in Cancun. In preparation, the group met weekly for several months leading up to the negotiations to fundraise, gain literacy about the most important issues to be addressed in the negotiations, and learn about the fundamentals of blogging and interview skills to navigate the complicated U.N. conference procedures. While in Cancun, the Brown team worked in conjunction with the members of the Latin American Platform on Climate to report the key issues in the negotiations for Latin American countries and their perspectives. Some students also spent much of their time outside of the negotiations with social movements such as La Via Campesina – an international movement in defense of small-scale sustainable agriculture. Student and faculty blogs included topics such as “Climate justice movement increases potency in Cancun”; “The patient is alive: a turning point for multilateralism in Cancun?”; “Show me the money: securing trust in Cancun is contingent on cash”; and “President Morales tells world leaders not to forget the people”, to name a few. The trip allowed students to gain important research, writing and media and interviews skills; to strengthen their knowledge and understanding of international climate change politics, civil society, and Latin America; and to establish new contacts while operating in an often hectic and unpredictable environment. The talks, in short, were demystified, and students were exposed to the many potential ways to participate in them. In addition to the group’s focus on Latin America, Ciplet and Roberts supported the efforts of the LDCs negotiating group by drafting negotiating positions, preparing public statements, compiling data on climate finance and climate disasters, and supporting basic logistical needs. Our efforts in this regard were made possible by years of contact with the London-based International Institute for Environment and Development (IIED) and the European Capacity Building Initiative, from Oxford. IIED served as the go-between between the LDCs and CDL; we presented at several official side events on research that we conducted for them on whether wealthy countries had met their pledges to provide climate finance, and on the administrative needs to effectively deliver that funding. Upon returning to Brown after Cancun, the group focused their efforts during the second semester on preparing a conference on “Latin America and Climate Change: Regional Perspectives on a Global Problem,” which brought together numerous leading climate experts from the region. Keynote speeches were delivered by former Chilean president and U.N. Special Envoy on Climate Change, Ricardo Lagos and ex- Brazilian Minister for the Environment, Marina Silva. The conference shed light on Latin American countries’ positions and perspectives and explored how and why Latin American countries matter for global climate politics. CDL members presented a report that they had written based on their experience, ‘The Brown Report from Cancun.” The students also drew upon their experiences and blogging in Cancun to successfully present on a panel on themes such as the impacts of climate change in Latin America, the role of civil society in climate politics, and the emergence of Latin American policy discussions on adapting to climate impacts. The combination of preparing for the negotiations in Cancun, conducting engaged research while at the negotiations, and participating in a conference at Brown afterwards provided students and Lab leaders various opportunities to learn new skills, hone older ones and make a valuable, albeit modest, contribution to a difficult negotiating process. The CDL in Cancun had been a success. However, we knew that improving upon both the student experience and our impact on international climate policy would require a more intentionally organized effort. During the summer of 2011 we developed a plan for developing a formalized research group. In line with our focus on engaged education and global just sustainability, we decided that the purpose of this group would be to contribute timely, accessible and impactful content that informs more just and effective global policy making on climate change, particularly on the issues of climate justice, equity and finance. These were issues that we were already working on with IIED, the LDC negotiating group, and the Latin American Platform on Climate. We thought that a more structured research group could effectively strengthen these efforts while offering transformative learning experiences for Brown students. The CDL included students that had participated in the Cancun team, and also other students that were active in the Center for Environmental Studies where Roberts was Director. During our first meeting we gathered input from students on what they were looking for in the Lab experience, expressed our own goals, and assessed the level of interest in attending the upcoming negotiations in Durban. We asked everyone to include their research interests, background and goals for the Lab in a shared file. Based on student input, we decided that the Lab would not be a for credit course, but rather a voluntary working group and a type of informal internship. We then developed a plan, which we revisited and adjusted often during the semester in response to initial overestimates of what we thought we could accomplish. Significantly, fundraising and trip logistics ended up taking far more time than we had hoped. While at the time we viewed this as a distraction from getting to the “real work”, in retrospect, fundraising was an important learning experience for the students. Not only did it require students to learn skills of resourcefulness in finding pockets of money around the university and developing initiative in being bold in their requests, but it also helped them and us to refine and polish our research interests, and to learn to communicate them effectively, making clear its importance. The CDL was run with three main activities: fundraising and logistics; guest speakers; and research development. We set out three main requirements for students attending the negotiations in Durban: (1) Students would sign an agreement before departure agreeing to the expected quantity of work and specific tasks to be carried out; (2) They would create an account on the Brown University Watson Institute for International Studies’ Global Conversation blog prior to departure; and (3) they would contribute to the team research agenda to be assembled prior to departure. All members of the CDL were required to develop three main research interests for Durban, and an initial list of five potential interviewees that they would contact before arriving. After much discussion, we settled on five main themes to focus the research of the group, as discussed below. In addition, we decided that Roberts, Ciplet and Edwards would each assume responsibility for mentoring and editing blogs of three to four CDL students while in Durban. We also created an initial blogging schedule, with the intention that we would post at least one blog every day during the negotiations. Blog posts would be posted on a new blog platform that two CDL students set up shortly before the negotiations, in addition to using the Intercambio Climático website when relevant to Latin America. We also agreed to post our blogs on the Global Conversation site. We also set up a Twitter account for the CDL, and created a schedule so that one person was responsible for tweeting relevant information each day. We printed flyers and business cards, which we handed out in Durban to publicize the new CDL blog and Twitter account. Roughly a month before the trip, we also agreed to support the LDCs in two main ways. First, members of the Lab conducted research on climate-related disasters and deaths in the LDCs. We then used this data in drafting text for the opening comments of the Chair of the LDCs in the negotiations. Second, we conducted research on LDC specific climate finance needs, and in conjunction with members of the LDC group, we utilized this data to write a climate finance demands paper to be used by delegates in the negotiations. Ciplet and Roberts also published a report with IIED assessing donor transparency in climate change finance. And Ciplet, Roberts, and two CDL students, Spencer Fields (BA Candidate in Environmental Studies and Hispanic Studies) and Linlang He (MA Candidate in Environmental Studies) published a report with IIED that analyzed the extent to which wealthy countries had delivered on their promises to provide adaptation finance to developing countries. Both IIED reports received extensive coverage in the media, as well as being referenced by delegates in the negotiations, particularly by our contacts within the LDC group. The experience of bringing a group of students to U.N. climate negotiations in Cancun facilitated the next year’s preparations, and led us to be even bolder in what we undertook. At Durban, we addressed five sub-issues: the U.S.’s policy approach, climate finance, the LDCs group, agriculture, and Latin American countries. Each brought together overlapping groups of students and leaders of the Lab. We detail the actions of these groups here because they reveal some of the things that small, focused teams can achieve, the way we harnessed diverse student interests and experience, and some of the difficulties we encountered. Two CDL students, Kelly Rogers (a Master’s Candidate in Public Policy) and Graciela Kincaid (a BA Candidate in International Relations), focused their research in Durban on following the U.S. delegation. Rogers’s primary objective was to understand the motivations behind the U.S. delegation’s positions, particularly as they related to domestic Congressional dynamics. To this end, Rogers interviewed current and former members of the U.S. delegation such as two staff members from the House Committee on Science, Space and Technology, as well as a top official at U.S. Treasury. And Rogers attended events such as a panel on the role of U.S. public opinion and U.S. elections on climate policy. Rogers also pursued a secondary research focus on private-sector involvement in Durban, including the role that the energy industry plays. Rogers attended a natural gas trade association side conference, which gave insight into the strategies used by the private sector in international climate negotiations and domestic energy promotion. Kincaid focused her attention on following the U.S. delegation’s position on climate finance. Kincaid conducted research to strengthen her paper with Roberts on the Obama administration’s public rhetoric on climate change and position on climate finance. As a result, Kincaid paid close attention to the U.S. delegation’s publication of its official aid numbers, particularly its Fast Start Finance commitment, and the budgetary balance between adaptation, mitigation, and forestry. Kincaid was able to attend briefings from the U.S. lead delegate, Jonathan Pershing, and was able to meet Mr. Pershing and ask him a question directly. Over the course of her week in Durban, Kincaid produced several blog posts and conducted two interviews, with analysts from relevant NGOs. The two analysts confirmed much of the working hypotheses of her paper and provided crucial insights into the week’s proceedings. Another group of CDL members focused on the issue of climate finance in Durban. This group included Ciplet, Roberts, Fields and He. Leading into Durban, there was an ever-widening chasm between the support developing countries need to adapt to climate change, and the funding promised and actually delivered by wealthy nations. This group focused its efforts in Durban on providing useful products and communications to support progress towards climate finance that is transparent, adequate, accountable and equitable. In pursuit of this goal, the group produced three main products in the lead-up to Durban. First, in September, in conjunction with IIED, we released the briefing paper Scoring fast-start finance: leaders and laggards in transparency. This document was widely cited in both formal negotiations and side events by developed and developing country delegates in the UNFCCC meetings in Panama prior to the Durban Conference. This led to later discussions with personnel of the U.S. State Department to encourage them to make their climate finance reporting more transparent. Transparency emerged in Durban in several negotiating sessions, and some members of the LDC group believed that our briefing paper was instrumental in moving this conversation forward. Second, in November, also in conjunction with IIED, this group released a briefing paper updating progress on finance for climate change adaptation, titled, Adaptation finance: How Durban can deliver on past promises. The briefing received extensive coverage in the China Daily Newspaper and other international media outlets. The briefing was widely referenced by LDC and other developing country delegates in negotiating sessions in Durban, helped to keep adaptation at center stage in the negotiations, and provided a framework and concrete figures necessary to assess progress on this important issue. Third, at the request of the Chair of the LDC negotiating bloc, this group developed a briefing paper titled, Least Developed Country demands for replenishment of the LDC Fund (LDCF). Its purpose was to collect updated figures on donor contributions to the LDCF, discuss obstacles to effective and adequate funding practice, and present the key demands of the LDCs. LDC delegates took this paper and distributed it to various developed and developing country delegates. We were told that the paper was very useful in communicating progress and needs on finance for the LDCF. A few additional financial contributions were made by wealthy countries to the LDCF in Durban. We also wrote several blog entries on adaptation finance, the LDCF, and transparency, with one picked up by the media outlet Reuters AlertNet. These efforts led to a number of successful new projects upon returning home from Durban. In addition, upon graduation, Fields pursued his interest in climate finance by doing an internship in Washington, D.C. with the Worldwatch Institute on related climate finance issues. Several Lab members supported the efforts of the LDCs’ negotiating group in Durban. Such efforts included researching climate-related disasters and deaths in the LDCs, and drafting relevant language for the opening comments of the LDC group Chair; developing a briefing paper on finance in the LDCs (discussed above); and providing direct logistical support to the LDC group during the negotiations. In particular, in the lead-up to Durban, the Chair of the LDC group asked us if there was a CDL member who would support the LDC group during the two weeks of negotiations and a week of preparation preceding the negotiations. This was an important role, particularly given the limited capacity that the LDC group has to intervene effectively in the negotiations. Brianna Craft, a first year MA Candidate in Environmental Studies, enthusiastically and successfully embraced this role. For three weeks, Craft assisted in setting up the daily LDC Coordination Meetings; managed the Chair’s schedule; edited press briefings, speeches and other LDC documents; and organized and scheduled Ministerial Bilateral Meetings. As she explained, “[I] suffered through sleepless nights. The frustration of deadlocked multilateral meetings and the opacity of the UNFCCC negotiation process is an introduction to the COPs [Conference of Parties] that I shall never forget.” Craft was able to continue this role in two future UNFCCC conferences in Bonn, Germany and Doha, Qatar in 2012, conducted a related summer internship at the UNFCCC in Bonn that year, and ultimately, may secure a job working on behalf of the LDCs with the organization IIED. This work was instrumental for her in researching her Master’s thesis, which investigated the LDC efforts to access technology through the climate negotiations. Agricultural production stands to be harshly impacted by the effects of climate change, and the issue skyrocketed in the 2012 talks. Many developing nations, whose primary economic and social structures are built around agricultural production, desperately need the financial resources to adapt. Agriculture is also a significant contributor to greenhouse gas emissions worldwide: contributing about 14% of greenhouse gas emissions (IPCC 2007). Durban marked the first climate change negotiations at which significant progress on agriculture was expected to occur. Our team’s goals in South Africa were to gain an understanding of the different views of what is being called “climate-smart agriculture” in order to better understand conflicting definitions; and to gain insight into how competing ideas about agriculture are being incorporated into the United Nations Framework Convention on Climate Change (UNFCCC). While in Durban, our team interviewed several experts in this area. These conversations helped them explore some of the nuances of climate-smart agriculture and to immerse themselves in this complex discourse. Drawing on these interviews, the team produced several blogs summarizing their experiences and the developments related to agriculture in the negotiations. Upon returning home, this group continued their research in an effort to develop a policy brief for the LDC group summarizing climate-smart agriculture, and evaluating how it might impact LDCs. However, they never accomplished this task as a result of being sidetracked by competing priorities such as finishing other course research papers and applying for professional jobs. While less of a focus in Durban than in Cancun, our objectives in Durban on Latin America were multiple. These included establishing contact with relevant country negotiators and civil society organizations, conducting interviews with Latin American negotiators for the forthcoming book manuscript on climate change politics in Latin America, writing blogs posts for the Intercambio Climático site, and conducting background research for a Climate and Development Knowledge Network (CDKN) policy brief on the implications of the Durban negotiations for Latin America. CDL members were able to build on the contacts made in Cancun in 2010, with Latin American country negotiators and civil society organizations. A number of interviews were carried out with lead figures from national delegations, including a video interview conducted in conjunction with the CDKN with the head of the Bolivian delegation, Rene Orellana. Roberts and Edwards were invited to participate in the daily meetings of the Climate Action Network – Latin America, which led to the CDL developing important contacts with Latin America civil society actors heavily involved in monitoring the negotiation process. The CDL team was also invited to draft a press release for the Construyendo Puentes (Building Bridges) initiative that aims to bring together Latin American negotiators and civil society organizations, following their principal meeting in Durban. Several articles were drafted and published by Lab members on our own blogs, as well as sites such as Reuter’s AlerNet. Topics included issues such El Salvadoran adaptation agenda, Catastrophic Risk Insurance in the Caribbean, and Mexico’s role in the negotiations. Following up from Durban, we again retooled for the 2012 Spring semester. In March 2012, Edwards co-authored a policy brief for CDKN and Energeia Network with two Latin American negotiators entitled, Shaping the Durban Platform: Latin America and the Caribbean in a future High Ambition Deal. This was circulated extensively and was positively received by our Latin American partner organizations. Then in April, members of the Lab organized a conference at Brown called ‘China, Climate Change, Security and the Developing World’. This conference looked at how China will manage both rapid economic growth and attention to climate change. There were various high level speakers including top experts from China and Sheldon Whitehouse, U.S. Senator from Rhode Island, and Dan Reifsnyder, Deputy Assistant Secretary for Environment and Sustainable Development at the U.S. Department of State. Participants discussed the roots of China’s domestic economic and environmental policy and how these influence its positions in the U.N. negotiations. Each member of the CDL group also spoke about his/her learnings and accomplishments in the negotiations in Durban, and reflected on the state of international climate change politics. During the following academic year, fall 2012 through spring 2013, with Roberts on sabbatical, we paused weekly CDL meetings. However we continued to work, mostly remotely, on policy briefings about climate finance, Latin America in the negotiations, and two major book projects. In the summer of 2012 and the lead up to the UNFCCC negotiations in Doha in late fall 2012, five members of the CDL researched and wrote two influential policy reports. The first, The eight unmet promises of fast-start climate finance, was published with IIED, and researched as part of our Lab. This report assesses the extent to which wealthy countries have delivered adequate finance to developing countries to prevent and adapt to climate change over 2010-2012. The research was widely cited by delegates during the UN negotiations in Doha, and received coverage in 150 media outlets in 22 countries, including The New York Times, the Guardian, Reuters, the Washington Post, and Bloomberg Business Week. These issues concerned delegates significantly in Doha, especially during the first week of the negotiations. The second report is titled the Least Developed, Most Vulnerable: Have Climate Finance Promises Been Fulfilled for the LDCs? This report was published in April, 2013 by the European Capacity Building Initiative and Oxford Climate Policy. This report built upon our analysis in the IIED report, and offers data and recommendations specific to climate change finance in the 48 LDCs. In total now, Lab members have authored ten reports related to climate and equity issues. In this section we discuss some of the key things we learned, based in part on a survey filled out by all CDL members. We discuss what this tells us about the challenges and opportunities in engaged education for global just sustainability. We identify and discuss two issues that warrant further reflection. Table 1 presents a summary of individual responses to the questions posed. First, we have found that there is a tension between conducting justice-oriented public advocacy work and maintaining an educational space that is amenable to multiple perspectives. In particular, the question emerged, how do we run a successful blog with a focus on justice, while also allowing for dissenting opinions or differing worldviews in the group? We sought to have a blog that had broad impact and that offered a perspective that moved beyond simplified narratives and loose rhetoric. We encouraged critical thinking that could be backed up by empirical evidence and concrete examples. However, we also defined our blog as being justice-focused, and thus giving particular voice to marginalized communities (however they be defined), and seeking to advance issues of justice and equity in some way. In general, while we often worked with students to ensure that their work was of high enough quality and substantive value, we found that students nearly always met the criteria of the blog, while offering a diversity of perspectives. However, in one case, we did end up choosing not to publish an article from a student that had only sought out the perspectives of actors with power. In this case, the blog post clearly did not meet the criteria of the blog site. In the written evaluation of the Lab, one student did comment that, “Outputs would be more valuable if they showcased contrasting, more moderate opinions”. We can see that there may be future cases in which it is difficult to draw the line between what may be considered student censorship as compared to discerning, mission-oriented and effective blogging. This is an issue that we will continue to grapple with and reflect upon, particularly if we decide to make the CDL a formal course for credit, rather than an elective working group. It is also a tension that may be inherent in the pedagogy of engaged education–where student learning and scholarship for social justice are equal goals. From this perspective, some ways of thinking and doing reproduce injustice and inequality in the world, while others serve to challenge them. However, while we can be clear on the goal of working for justice, there are many differing perspectives and much ambiguity on what this means when applied to a given issue. It is perhaps in the intentional, critical and open-minded engagement with these areas of ambiguity, where the most fruitful, worthwhile and transformational education can take place. A second issue that we faced is how to use our limited time effectively. The CDL itself has many competing priorities, from in-depth classroom study of climate change politics, to engagement with ‘experts’ in the field, to fundraising and trip preparation, to research and blogging. How do we supplement outward engagement with sufficient knowledge and skill development? How do we take advantage of opportunities and be highly productive without over-committing? How do we prepare students effectively for travel to climate change negotiations without spending all of our time on this? We have found that striking the right balance between these areas has been a major challenge. Evaluation by CDL members also indicates competing perspectives of how we can allocate time more effectively. Notably we ask students to not only understand and follow an issue, but to offer a unique and useful perspective to a public audience. This inevitably requires a strong foundation of basic literacy on the issues being studied; a background of how the issue of climate change fits into broader political, ecological and social systems; skills in navigating complicated UNFCCC proceedings; the ability to effectively conduct interviews, writing and blogging for diverse audiences; etc. We have been fortunate to have students with a broad range of skills and knowledge in the CDL, and most have entered the group at a proficient level. Still, evaluations suggest that we could have done more to provide adequate preparatory work, particularly in developing a basic knowledge about climate politics, helping students to navigate the UNFCCC proceedings, and enabling students to connect with experts in their field. In the future we may add a couple sessions on “climate policy fundamentals” at the start of the academic year. Finding the right balance between competing priorities will likely come with time, particularly as we take into account student feedback in evaluations. There are several options for students to achieve environmental and climate policy literacy at Brown, including participating in other courses that Roberts and others teach. In addition, finding a source of long-term funding to support CDL travel would enable us to re-allocate time currently spent on individual fundraising for travel expenses to other areas. We now turn to a brief discussion of future directions for the CDL. 1. How would you rate the core activities of the CDL? For example: blogging, reviewing articles, bringing in outside speakers, preparing for and attending UNFCCC negotiations, etc. – All activities regarded as popular- Attending negotiations was considered a success- Blogging regarded as a productive activity- One person regarded blogging as a bit of a waste of time due to- low readership- Blog diversity and censorship – how do we strike balance between avoiding echo chamber but also ensuring quality control and establishing an identity of the blog site? 3. Do you find the CDL sufficiently challenging and intellectually stimulating? – All answered yes, although one comment on more individual work individual papers, etc. The CDL is reshaping again as nearly all the students will have graduated. We are considering different options for future directions: formalizing the structure of the CDL, ensuring skills learned in the Lab are transferable for the job market, and stabilized funding. All would be built on the relationships established in the past with experts and delegations from around the world, and new ones developed in 2012-13. First, we are considering various options for strengthening and formalizing the structure of the CDL. From the faculty and student positions, it may be valuable for the CDL to be considered a course, to reduce competing pressures. This would change the Lab in many ways: students would have more time to dedicate to CDL projects, but they would take on a different character. And as the CDL gains popularity, and as we work to enhance the positive impact of the group, we see the need to tighten recruiting and screening of participants. The CDL seems to work best with 6-10 students, and 3 leaders. Students participating in the Lab are generally expected to work with Professor Roberts on a doctoral or undergraduate thesis at Brown, but there should be spaces for other students as available. This is a clear trade-off, if excellent students are excluded in the future. As we do so, we are looking for students with a strong interest in justice in the global climate change negotiations, the ability to write concisely on complex topics, experience of using social media and interview techniques, and the ability to demonstrate logistical skills and the willingness to travel. Second, the experiences, connections made, and skills that students have developed through the CDL will likely be of vital importance in helping them as they enter into a highly competitive job market. We know that at least two CDL members have already gained internship and/or employment positions that are directly related to their work in the Lab. The CDL helps to build students’ resumes and real world experiences, on skills that in most cases would have to wait until leaving university. Given the current economic climate and stiff competition for graduates to get jobs, it is not uncommon for graduates to do an internship as a stepping-stone towards a full-time paid position. Given the level of the Lab’s output and students’ opportunities to engage in the climate change negotiations, make contacts, interview leading experts and lead on research and writing work, student participation in the Lab can be regarded as the equivalent of an internship. We feel that we can strengthen the ability of the CDL to serve as a launching pad into climate justice-related careers. Possible ways to do this may include surveying recent graduates on how to improve job market preparation, creating more opportunities for students to participate in high-level activities such as authoring briefing papers, writing op-eds, conducting research for book projects, and writing grants, and by cultivating a professional network to assist in job placement. Third, more stable funding is needed to make the CDL prosperous and sustainable over the longer term. Travel support to bring the group to the U.N. negotiations would save the students and leaders much time each fall and would increase the time we could spend on conducting research and producing research outputs. In addition, support for the Lab leaders’ time to organize meetings, mentor students, and develop research projects and contacts would be exceedingly helpful. We plan to make efforts in this direction by better marketing the Lab’s accomplishments on our website, searching for funding partners within the University, seeking potential grant funding or private donations, and strengthening our media presence. We also plan to research funding models of similar projects at other universities. Overall, we believe the potential of this type of learning is vast. Simply having the opportunity to attend a U.N. negotiation on climate change is extremely exciting and rewarding, and given the complexity of the proceedings, there is considerable value in just being there to learn and observe. As we have discussed, we have found that a tension exists with producing impactful justice-oriented and engaged research, while simultaneously creating a student-centered learning experience that values multiple competencies and perspectives. And navigating competing priorities with limited time and resources has been and will continue to be a challenge. Despite these tensions, the CDL has proven a strong model upon which to build. Students and leaders alike have had transformational learning experiences that have shaped our life paths, and we have also developed strong ties and cohesion as a learning community. Our engaged research projects have reached many audiences worldwide and we hear stories of government delegations referring to them in official and unofficial arenas. We have published articles in academic journals, book chapters in edited volumes, and produced two book manuscripts. In all, we have shared the joys and challenges of engaged education, and of working collaboratively for global just sustainability. Baer, P., T. Athanasiou, S. Kartha, and others. 2007. “The right to development in a climate constrained world: the Greenhouse Development Rights framework.” The right to development in a climate constrained world: the Greenhouse Development Rights framework. Barker, D. 2004. “The scholarship of engagement: A taxonomy of five emerging practices.” Journal of Higher Education Outreach and Engagement 9(2):123–137. Bullard R.D. 1999. “Dismantling environmental racism in the USA.” Local Environment 4:5-19. Butin, D. W. 2007. “Justice-learning: Service-learning as justice-oriented education.” Equity & Excellence in Education 40(2):177–183. Ciplet, D., J. T. Roberts, and M. Khan. 2013. “The Politics of International Climate Adaptation Funding: Justice and Divisions in the Greenhouse.” Global Environmental Politics 49–68. Faber, D. 2005. “Building a transnational environmental justice movement: Obstacles and opportunities in the age of globalization.” Coalitions across borders: Transnational protest and the neoliberal order 43–68. Harkavy, I. 2006. “The role of universities in advancing citizenship and social justice in the 21st century.” Education, citizenship and social justice 1(1):5–37. IPCC (2007). Climate Change 2007 (Fourth Assessment Report): Synthesis Report Summary for Policymakers. Geneva: IPCC. Iucn, U. 2011. “WWF, 1980.” World conservation strategy: Living resource conservation for sustainable development. Parks, B. C., and J. T. Roberts. 2006. “Globalization, vulnerability to climate change, and perceived injustice.” Society and Natural Resources 19(4):337–355. Retrieved September 18, 2012. Roberts, J.T., and B.C. Parks. 2006. A climate of injustice: Global inequality, North-South politics, and climate policy. Schlosberg, D. 1999. Environmental justice and the new pluralism: the challenge of difference for environmentalism. Oxford University Press, USA. WCED, UN. 1987. “Our common future.” World Commission on Environment and DevelopmentOxford University Press. [i] This work is also available on our blog: http://climatedevlab.wordpress.com.